LOS ANGELES (CNS) — The octogenarian lovebirds come every year to celebrate World Marriage Day at the Cathedral of Our Lady of the Angels. 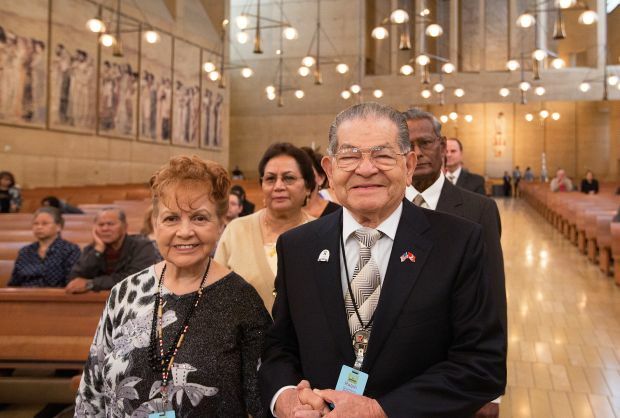 Married at La Placita Church in Los Angeles Nov. 25, 1951, 85-year-old Ralph Guerrero and his wife, Mary, 84, were the longest-married couple among 81 couples at the World Marriage Day Mass in English at the cathedral Feb. 9. At a Spanish-language Mass celebrated a couple of hours later, nonagenarians Benjamin and Angela Moran — married 75 years ago in El Salvador — were honored as the longest-married among 75 couples at that Mass. The number of couples attending the Spanish Mass doubled from last year and at this year’s English-language Mass participating couples increased by 10 couples over 2013. Reflecting in his homily on the imagery of “salt and light” in the Gospel reading, Los Angeles Auxiliary Bishop Oscar A. Solis, the main celebrant at both Masses, said married couples have a special mission to become the salt of the earth and the light of the world by the way they live their faithful commitment in their married life. “Today we are here with you in order to ask Our Lord’s continued blessing upon you, your family and our community that you remain committed to your love for one another and to become witnesses of God’s love, hope and service,” said Bishop Solis. The Los Angeles Masses were among several celebrated across the country to mark World Marriage Day and National Marriage Week, observed Feb. 7-14. Held each year, both observances are opportunities “to celebrate the gift and blessing of marriage and to affirm and support engaged couples,” said Bishop Richard J. Malone of Buffalo, N.Y., chairman of the U.S. bishops’ Committee on Laity, Marriage, Family Life and Youth. He made the comments in a recent letter to all U.S. bishops encouraging dioceses to hold marriage conferences, retreats and other programs. National Marriage Week, now in its fifth year, is a joint effort by faith communities, business, media, education and nonprofit groups. As Bishop Malone noted in his letter, the week promotes marriage as a benefit to husbands and wives and to the nation, as well as “the best environment” in which to raise children. World Marriage Day, held the second Sunday of February each year, was started in 1983 by Worldwide Marriage Encounter. In Los Angeles, following his homily, Bishop Solis led participating couples in a renewal of their vows. Before he did so, he joked, “Be sure that you’re facing your right spouse,” prompting laughter from the congregation. At the conclusion of the liturgy, married couples who had previously registered with the cathedral were invited to have their photo taken with Bishop Solis in the area behind the crucifix on the altar. They then received a certificate from the cathedral commemorating the celebration of their wedding anniversary. “We’ve always felt that marriage is an important sacrament for us,” said Patrick Gavit, interviewed by The Tidings while standing in the photo line with his wife of 25 years, Marie Ebiner Gavit, parishioners at St. Louise de Marillac in Covina. “We’ve been married 28 years, and we thought it would be important every year to celebrate at one of the World Marriage Day Masses within the archdiocese,” said Paul Montgomery. He attended with his wife, Marisa, parishioners at Our Lady of the Assumption Church in Ventura. They are local liaisons for Retrouvaille, an organization that teaches communication and conflict management skills to help couples improve their marriage. Simon Torres, who was there with his wife, Dolores, gives a lot of credit to his wife for their happy 25-year marriage, which began with their wedding at their parish church of St. Finbar in Burbank. Reflecting on his 62-year marriage, Ralph Guerrero — who serves as an extraordinary minister of holy Communion along with his wife, Mary, at the cathedral — attributed the longevity of their union to their Catholic values. Carlos Moran, translating for his Spanish-speaking grandparents celebrating 75 years of marriage, said that their Catholic faith was very important in their family of eight children and 32 grandchildren. Angela Moran, 94, shared that her husband, Benjamin, 98, who was a farmworker in their native country of El Salvador, worked very hard in the fields cultivating crops like corn and beans. “Because we are Catholic, we’ve been happy all the time,” said Angela. Doyle is a staff writer at The Tidings, newspaper of the Archdiocese of Los Angeles.